The genus name Scutellaria and common name skullcap derive from the Latin scutella, "little dish," in reference to the plant's inverted calyx cup, which looks like a helmet with its visor raised, and also somewhat like a skull. The common name mad dog weed resulted from the plant's use by a Dr. Vanderveer in the 1700s to treat people who had been bitten by rabid dogs. Skullcap, a perennial native to North America and Eurasia, grows from 1 to 3 feet tall and has a square stem. The leaves are lance shaped, opposite, 1 to 3 inches long, and coarsely serrated. The hermaphroditic, pale blue flowers are tubular with a two-lipped, hooded corolla; they grow paired on spikelike, one-sided racemes from the leaf axils. 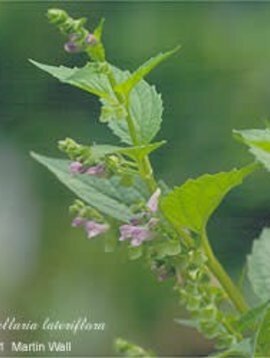 Native Americans and early European settlers used skullcap as a treatment for malaria when quinine was not available. It was included in the United States Formulary from 1863 until 1916. Skullcap calms and strengthens the nerves, relaxes spasms, relieves pain, and promotes rest. It can help rebuild nerve sheaths. One of its constituents, scutellarin, is transformed in the body into scutellarein, which helps stimulate the brain to produce more endorphins. Skullcap is used to treat addiction, alcoholism, anger, anxiety, attention deficit disorder, chorea, convulsions, delirium, dysmenorrhea, emotional upset, epilepsy, excessive libido, fear, headache, hiccups, high cholesterol, hypertension, hysteria, insomnia, multiple sclerosis, muscle cramps, nervous exhaustion, nervous stomach, neuralgia, pain, palsy, panic attacks, Parkinson's disease, premenstrual syndrome, restlessness, rheumatism, spasms, tremors, and withdrawal symptoms (from alcohol, drugs, and tobacco). Skullcap works best when given over a period of time. It loses its properties more quickly than many herbs; herb stock that is more than a year old is not likely to have much therapeutic value. In folkloric tradition, women wear skullcap to keep their husbands from being charmed by other women. Avoid during pregnancy. Large doses may cause confusion and giddiness.